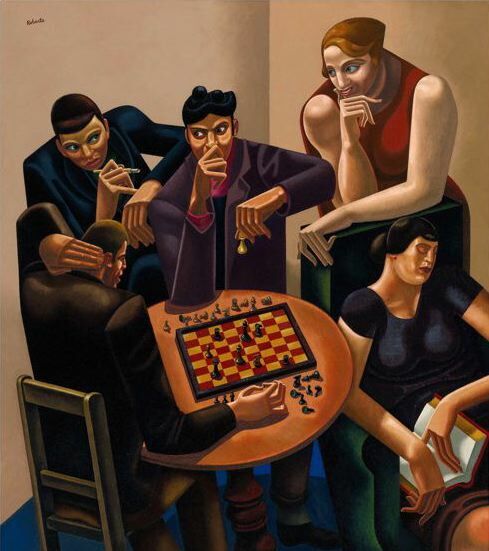 The sale of William Roberts's The Chess Players 192930 for £1,161,250, after a four-way bidding battle at Sotheby's on 10 May 2012, was a striking vindication not only of Roberts but also of this painting, which had not always been well received. In 1931 P. G. Konody in The Observer described it as 'a dramatic rendering of a whole phase of human life and nature' and praised Roberts's 'faculty of stating with unerring precision the essential character of certain aspects of humanity'. Then in 19345 the picture was one of 253 works of 'Contemporary British Art' which the Empire Art Loan Collections Society sent to tour New Zealand and Australia. 'Much Disappointed' complained of WR's 'decadent figures with small heads and monstrous hands', and saw in many of the pictures 'the modern worship of ugliness instead of beauty'. A. Wells Newton was baffled by 'the mentality of a man who depicts fellow human being as [Roberts] does . . . Does this man hold a low view of his fellow creatures, or is this merely his joke against the critics?' For him, Roberts's work was 'not art, but rather . . . a travesty of art, a stultification of and almost one might say a prostitution of art'. And there was more in the same vein. In Melbourne The Argus 's reviewer commented that 'The player in the foreground with the diminutive cranium appears to be innocent of the possible violence in the rolling blue eyes of his companions; the lady with the enormous deltoids looks a match for anyone with either dagger or pistol; and the lady with the luxuriant bosom looks completely "fed up" not only with her lay figure hands, which cannot turn the page, but with everything else.' And so it went on. William C. Quin in The Advertiser (Adelaide), 18 February 1935. Olive Neville in ibid., 25 February 1935. Arthur Streeton in The Argus (Melbourne), 29 May 1935. 'Modern art shocks for Wolverhampton', Express and Star (Wolverhampton), 13 March 1937. THE PICTURE "THE CHESS PLAYERS." For a picture to be artistic it must be well done. Details introduced should be more or less correct. Although modern thought is of opinion that it is comparatively unimportant what the method of artistic expression may be, it is false in art for educated and trained men to imitate the styles of less cultured beings. After making the above brief statements of fact we draw attention to the painting, "The Chess Players," by William Roberts. It is at present being exhibited at Dunedin. For those Chess players who may be interested, and also for those who know very little about Chess, we explain that, the game position depicted is one that none but the very weakest of players would arrive at. . . . White (the player in the picture with his hand behind his head) is queen, rook, and the exchange down, and has a hopeless position. He has just lost his queen for Black (the one with the forearm with length and breadth but no thickness) has it in his hand. White is apparently astounded at his last loss, but it is clear to us that he should have realised his troubles at least a move or two sooner. In fact he should have already resigned, although he has not actually been mated. We believe that the painter mistimed the dramatic moment; the Chess position is not coinciding with the expressions he has given the figures. Whatever may be said about the other features of the picture, the Chess part of it lacks art.